Green Cultural Travel continues to research existing volunteer programs to ensure that they provide a legitimate service and are delivering real benefits. We can assist in placing you in the right program where your skills and energy will be most effective. Green Cultural Travel is also developing its own outreach program to provide basic services to Cambodian rural communities. We sponsor our Green Travellers to deliver items such as clean water filters, building sustainable food gardens and the delivery of other essential services to help improve the recipient’s quality of life. Cambodia is a country rich in history, culture and beauty. But it is also a country of extremes where many people are still trapped in the cycle of poverty. 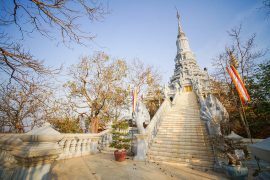 By volunteering in Cambodia you can experience the beauty of this country while reaching out a helping hand to bring life’s basic needs to those most in need, Volunteering is a spiritual journey that empowers those you help and enriches your own soul. Volunteering takes you to places away from the usual tourist centers. Experience this rich culture and the beauty of Cambodia and its people. Challenge yourself through volunteering to broaden your skills. You will never know your limits and capabilities until you test yourself. Volunteering is a journey into self discovery. It also allows you to reach out and share your skills with those most in need. Through helping develop small sustainable businesses, you can bring dignity to peoples lives that a once off handout cannot achieve. Cambodia has a large number of social programs which are not all driven towards benefiting those that are most in need. Here at Green Cultural Travel we are committed to maximising the benefits to the recipients through our own outreach program. We also have undertaken research into other social enterprises to assist you in finding legitimate, socially responsible and sustainable progams. Green Cultural Travel will work with you to understand your skills and what you are looking to achieve from your volunteering. We will work with you to find the right project or Non Government Organisation that is the best fit for you. We will ensure that it is a legitimate program that delivers real benefits to those that are most in need. Volunteer Travel is not like regular travel and sometimes you can be faced with situations where you need the support of an organisation to deal with a crisis or emergency. Green Cultural Travel has a 24 hour help line available to provide and support you may need.